The Chops Grille on Freedom of the Seas has had the reputation for being the best in the Royal Caribbean fleet. While I would not necessarily go that far, it is very good. It gets high marks for the flavor and quality of the food as well as the service. Chops (as it is almost universally called) is a steakhouse. There are other things on the menu but the signature offerings are the steaks. It is not gourmet fine dining but it is an upscale dining experience. It is probably not where you would go to propose but it is a place to go for a special night out. 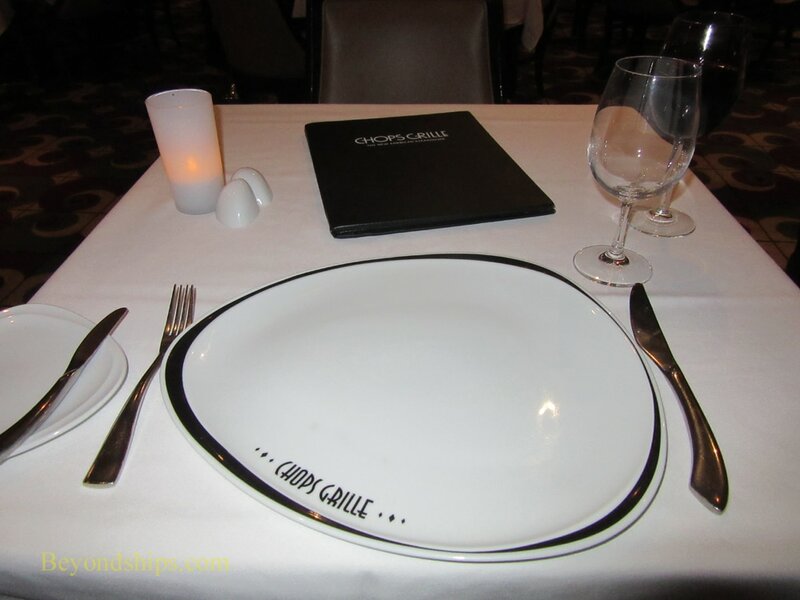 Essentially, all of the Chops Grilles in the Royal Caribbean follow the same menu. Thus, the experience differs from one ship to another based upon the location of the restaurant, the service and the talent of the people preparing the dishes. On Freedom of the Seas, the Chops Grille is located on Deck 11 on the port side near the Windjammer buffet restaurant. This is where you usually find the Chops on a Voyager or Freedom class ship. The décor is dark wood. On the port side, there are large floor to ceiling windows that offer panoramic views in the early evening light. Again, it is very much like the Chops on the other Freedom class ships and on the Voyager class ships. The service on Freedom was quite good. I was seated promptly at a nice table by the windows. The order was taken promptly and delivered promptly. There was nothing extraordinary here but there was nothing to complain about either. Solid and competent. The chefs may all be following the same recipes at the various Chops but different cooks have different touches and that comes through in the food. At Chops, I almost always order the signature nine ounce filet mignon and did so this time. It arrived cooked exactly as ordered, tender and not overcooked. In addition, with the wine reduction sauce, the meat had a subtle flavor that was quite delightful. On the starboard side of Deck 11 is Giovanni's Table. This venue replaced Royal Caribbean's earlier Italian restaurant Portofino. It was originally envisioned as a more casual Italian-inspired restaurant with family-style sharing. However, in the years since it first premiered, the family-style sharing has disappeared and the restaurant is now an upscale venue with the same level of formality as Chops. Although beef is not a big component of Italian cuisine - - except perhaps in some of the northern provinces - - my favorite item on the Giovanni's menu was for many years, a filet mignon. To give it an Italian flavor, the beef was prepared with gorgonzola butter. On some ships, the filet at Giovanni's outshone even the filet at Chops. However, in 2016, a corporate decision was made to substitute New York strip steak for the filet. Even leaving aside the fact that New York strip steak has nothing whatsoever to do with Italy, it is a much inferior cut of beef. Thus, the substitution made the dish unattractive to me. Therefore, I moved on and selected the Costolette di Angello alle Erbe. These are a stack of lamb chops prepared with a Merlot suace. You do not get a large quantity of meat here but what there is is delicious. Lots of personality. The sauteed spinach and baby vegetables also contributed to the dish. Along the same lines, the eggplant parmagenia appetizer is small but quite good. In a larger quantity, it could easily be a main course. I was not impressed by the Zuppa di Lenticche. This lentil soup was bland and would benefit from the addition of some spices. Desserts include the ever-popular teramimsu as well as different types of canolllis. I found the chocolate cake undistinguished even with the ice cream that the staff kindly brought from one of the ship's other restaurants. Considering that Italy is world famous for its ice creams, Royal Caribbean should consider adding such an option to its Giovanni's dessert menu. The upper level of the area once occupied by Freedom's nightclub, is now the specialty restaurant Sabor. This venue has a Latin-theme focusing primarily on Mexican cuisine. It is a very positive addition to Freedom's dining line-up. Sabor's décor bears no relation to the Gothic decoration of the previous tenant of this area. Instead, it is a sleek contemporary décor utilizing reds, blues and earth colors. For the most part, the lighting is dim but some ribbons of brighter lights provide accents to the overall geometric layout of the furniture. It has a different atmosphere than the original Sabor on Oasis of the Seas. On that ship, the Sabor is on the Boardwalk and is largely exposed to the elements. On Freedom, Sabor is an interior room with a more sophisticated feel. The portions are not very large so you can easily have several dishes. A must have at Sabor is the guacamole. It is made fresh by the side of your table. You can specify just how spicy you want it. The result is a combination of flavors that surpasses all expectations for guacamole. Next, I had the Plato Gordo burritos. This is an unusual combination mixing slow cooked duck, black beans and onions. This also tasted fresh and presented a combination of flavors. The Jalapeno-Garlic shrimp were also very good. It is rare to find spicy food on a cruise ship. Perhaps because of that the menu here warned that this is a spicy dish. Since I enjoy spicy food this was an attraction not a deterrent. I found it not overly spicy but rather distinctive and pleasing in character. In sum, Sabor gets high marks because of the sophistication of its atmosphere and the freshness and personality of the food.